ALAMEDA, Calif. (AP) — The Oakland Raiders will not get the No. 1 overall pick in next year’s draft if quarterback Derek Carr has any say in it. For the 15th time in the last 16 seasons, the Raiders will finish no better than .500, and that’s if they run the table over the final six weeks. Barring a sudden turnaround Oakland is headed for another top five pick in the draft. The Raiders are tied with the San Francisco 49ers and Arizona Cardinals for the worst record in the NFL at 2-8. Based on strength of schedule, the 49ers own the top overall pick followed by the Cardinals and the Raiders. Oakland held the No. 1 spot until beating Arizona last week to snap a five-game losing streak. 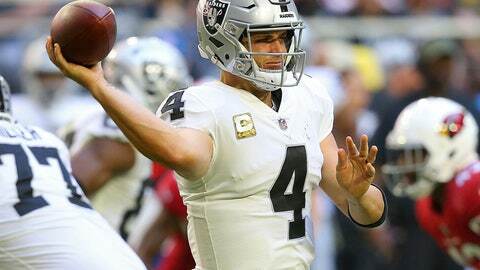 Carr is determined to keep the Raiders out of that position again. Since the merger in 1970 the Raiders have had the first overall pick one other time — in 2007 when they drafted quarterback JaMarcus Russell. Russell lasted just three seasons and is widely considered one of the biggest busts in NFL history. The Raiders had high hopes when the year began, with both owner Mark Davis and coach Jon Gruden talking hopefully of a Super Bowl before the team relocates to Las Vegas for the 2020 season. Those plans were derailed early when the team lost nine of its first 10 games. With the focus now on the future, the Raiders are hopeful of getting better through the draft. Through a series of trades that sent Khalil Mack to the Chicago Bears and Amari Cooper to the Dallas Cowboys, they have three first-round picks in 2019 and two more in 2020. Carr, the 36th overall pick in 2014, has repeatedly brushed aside talk of the Raiders tanking in order to get the No. 1 pick and said it’s more important for the team to establish a winning tone. Carr will have to do some more adjusting to make that happen. With wide receivers Jordy Nelson (knee) and Martavis Bryant (PCL) questionable, the Raiders signed Keon Hatcher off Green Bay’s practice squad. Hatcher was on Oakland’s 53-man roster coming out of training camp before being waived to make room for Bryant. The Raiders also lost Brandon LaFell to an Achilles injury suffered against the Cardinals. LaFell was placed on injured reserve this week. Notes: Wide receiver Johnny Holton was activated from the practice squad. Holton had been taking reps as a defensive back after beginning the season at receiver. With Oakland’s injury issues at the position, Holton was switched back to offense. . Nose tackle Justin Ellis returned to practice for the first time since suffering a foot injury in Week 1. Ellis is the team’s best run defender but Gruden declined to say whether he would be activated this week. . Wide receiver Saeed Blacknall and cornerback Arrion Springs were signed to the practice squad.